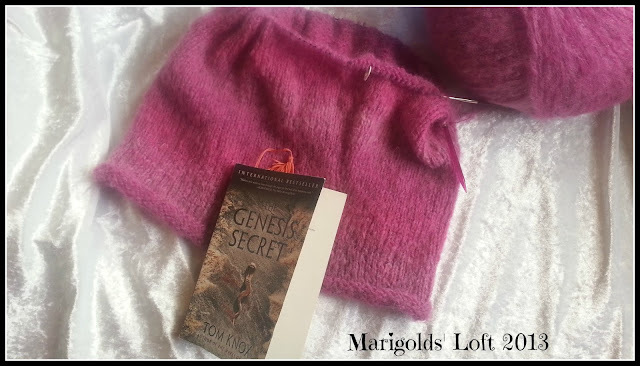 Marigolds' Loft: 1 Giveaway, 2 Books, 3 Projects - Oh My! Welcome back to another 'Normal' Wednesday. I can feel this project becoming a year long one again - now why was it that I put it into hibernation in the first place - hmmmmm! What can I say, spring is kind of here, so Hubby and I spent some time last week getting our garden ready for the warmer weather, should it ever arrive! 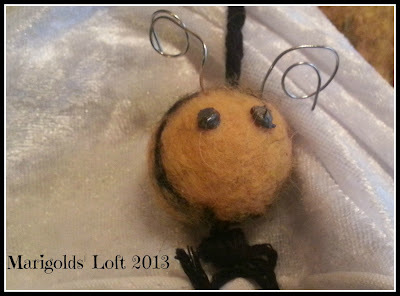 Tomorrow on Tutorial Thursdays Linky Party, I will be showing you how I created the little felted bee on the front of the bee bag. 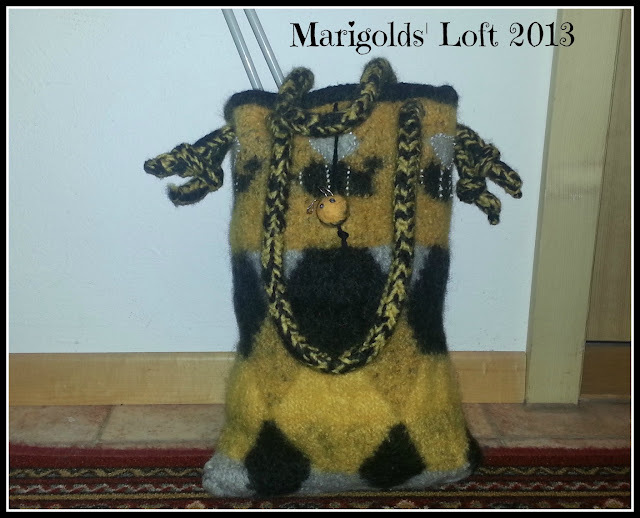 You are warmly invited to link up all of your weeks creations there too. If you would like to be a guest-blogger and show us your "How-to" on Tutorial Thursdays, I would love to hear from you. and have started "The Genesis Secret" by Tom Knox. I am enjoying this story so far, and will be finished it soon. As you may have read, our new Book-Club Selection Choice has been chosen. 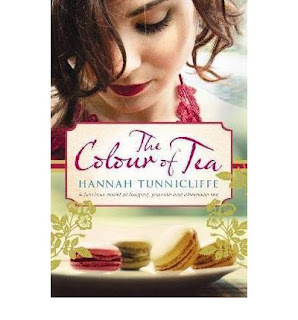 The Title for May is "The Colour of Tea" by Hannah Tunnicliffe. 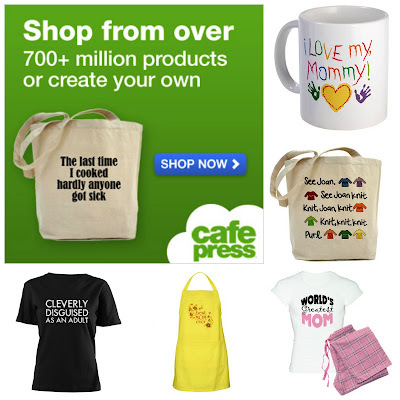 You have until the 9th May to win yourself a $20 Voucher from my wonderful Sponsors CafePress. Head on over there and grab your chances. 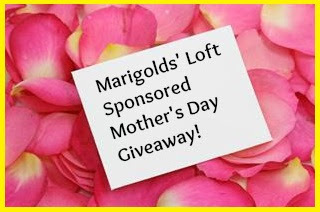 Talking of Giveaways - I still have 4 spaces left for those of you who would like to join in the Sponsored Mother's Day Giveaway. It is a great and easy way for you to get a bit of exposure for your blog and is very easy to do so. I would love this to be a smashing event! It would be awesome to be able to give back some internet love and make one mummy who wins feel very special indeed! I will be placing the buttons of those who have already signed up to contribute on my sidebar today, and as more folks sign up theirs will get posted there too. I will be sharing this over at Tami and Ginny today. It is my pleasure, hope it brings you some joy! Spring is arriving here in Ireland also, the projects look great and I can't wait to read the tutorial on the bee he's so cute. Looking forward to your thoughts on Friendship Bread, my library is getting that one in for me so I just have to wait for it but I did order my copy of The Colour of Tea and should arrive early next week, this one I'm really looking forward to starting as its high on my to be read next pile. How is the Genesis Secret ? I'm totally guilty of picking up the Malice Box in the library because of its cover lol, sometimes it works out great and other times not so great. The Genesis Secret is quite good so far, and easy read until now.